In August because of our generous parish an OB Ultrasound is now in use at the St. Nektarios Health Center. 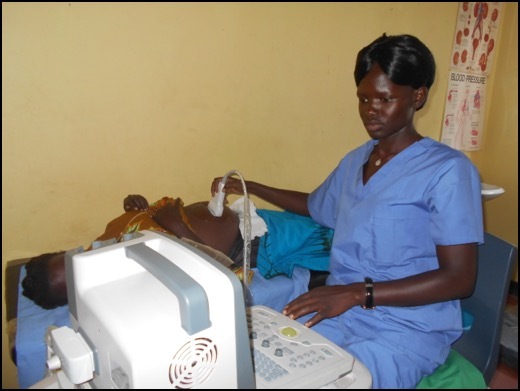 Nurse Midwife Betty has been trained and is using regularly the ultrasound during prenatal exams. This ability to assess the mother and baby before delivery provides for a safer birth for everyone. High risk problems and multiple births can be identified and those mothers will deliver in a hospital. Betty and her staff will deliver the normal pregnancies at the Health Center in their own village. The mothers are amazed that they can "see" their babies before delivery. The St. Nektarios Health Center Nursery School located across the road from the health center is in the process of having another classroom added This school encourages 3,4 and 5 year olds to start their education right in their own village. Parents recognize the importance of education for their children's future and work hard to pay their school fees. Many get help through the Mother's Union Sewing Project. Through your generous donations the young children will soon have another classroom. 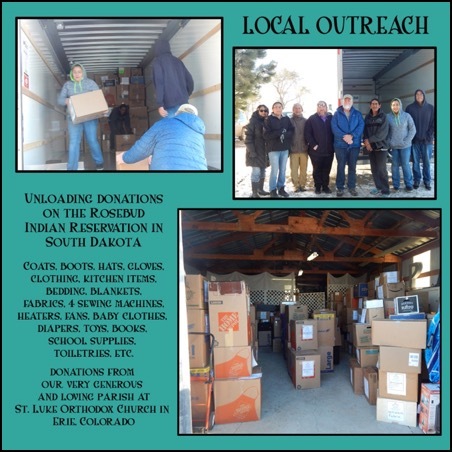 Many of our parishioners recently collected items to give to the Rosebud Indian Reservation, and then drove a truck there for delivery. Thanks be to God! Our next outreach locally is Thanksgiving Gift cards for the needy in our Erie Community, working with the Erie Food bank. 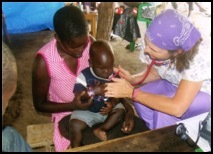 We are also working with Sue Nelson to provide mosquito nets in Uganda for a medical clinic there. The Collection on July 23 was an amazing $6,439! 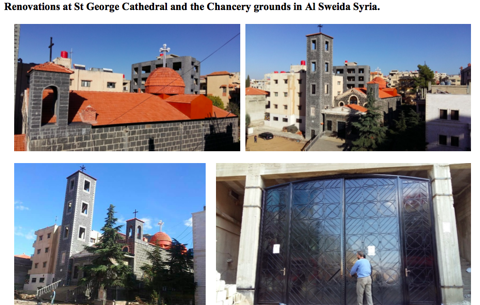 This helps the needy people in our Sister Diocese in Syria, a war torn area as seen in recent news as they try to survive and rebuild. Learn more about this outreach on the Archdiocese Website. In August 2017 over $4,000 was raised for charities and outreach. We also had over 20 church tours that were well received by people who had never seen our temple. 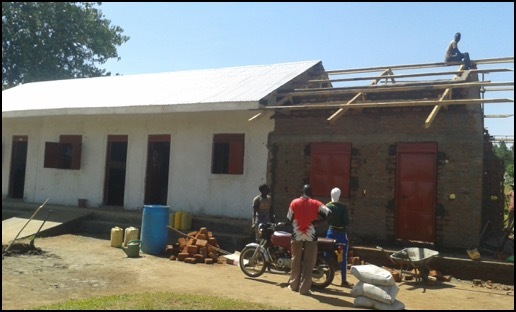 In 2015, Lift Up Uganda Inc. was founded by one of our parishioners, Sue Nelson, with the goal of helping people of northern Uganda through improving education and health care. Improving health through education for health promotion, illness prevention, and provision of direct health services allows for healthier people to help their families and communities thrive. This past Sunday (June 11) $6,565 was raised at the Coffee Fellowship dinner to help the needs of schools in Uganda. 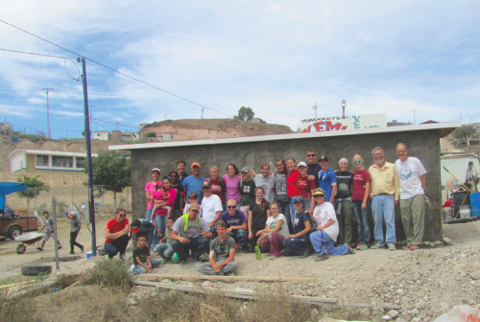 Since 1988, Project Mexico and St. Innocent Orphanage has been building secure, safe and weather-tight homes for some of the most impoverished families in northern Mexico. Built strictly by volunteer labor, these homes provide families economic security and hope for a brighter future. Many of our parishioners participate in this summer outreach opportunity. Denver Rescue Mission changes lives in the name of Christ by meeting people at their physical and spiritual points of need, with the goal of returning them to society as productive, self-sufficient citizens. St. Luke helps with serving meals on the 4th Sunday of every month. This is a simple way for us to give back to our community by providing food and clothing donations. There are extra outreach opportunities during the holidays as well. Our lives are made better when we are involved in our community. It is a pleasure to greet members of our community by participating in the Annual Erie Fair & Balloon Festival. We give free water at our booth, along with information about our Church. St. Luke Church supports the local Lafayette office with various volunteer outreach help year round. At Thanksgiving we help and serve dinner for clients. At Christmas we participate in their “Adopt-A-Mom” outreach program. We are involved with our Archdiocese in its outreach to Food for the Hungry, Special Olympics, and support for the needy Syrian people in this recent time of tragic civil war and terrorism. OCMC’s mission is to make disciples of all nations by bringing people to Christ and His Church. This also includes medical missions, support for long term missionaries working with local churches, and short term mission trips. The vision is that all people may come to know the saving love of our Lord: Father, Son and Holy Spirit. There are still over 4.7 billion people who do not know the hope, love and joy of a life in Christ. OCMC helps Orthodox Christians from North America welcome people around the world into the Body of Christ. This summer, one of our high school graduates is on a short term mission to Africa. Recently, our parish gave $1,000 for Bibles to be given to children in Albania for use in its camps. IOCC, in the spirit of Christ’s love, offers emergency relief and development programs to those in need worldwide, without discrimination, and strengthens the capacity of the Orthodox Church to respond. IOCC serves people in need of all religions, working with the federal government to receive matching funds. This is a local outreach to mothers in our community. It provides a place to meet with other moms, see and discuss an inspirational video, do a craft, while child care is provided. During the school year this happens a couple of mornings each month. During the summer there are play times in a local park.